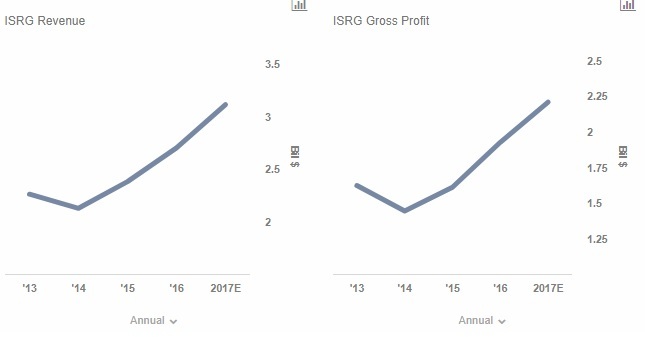 Intuitive Surgical’s (NASDAQ:ISRG) growth has accelerated in the last few years. In fact, we estimate that 2017 was likely its best year in terms of percentage growth since 2012. While selling more units of its flagship da Vinci Surgical Systems will continue to be its primary fundamental growth driver, the company is making an effort to ensure that the systems are adopted for a wide range of procedures. This should directly impact its revenue from instruments and accessories, which is not only a more stable and recurring revenue stream, but is also the company’s biggest one. 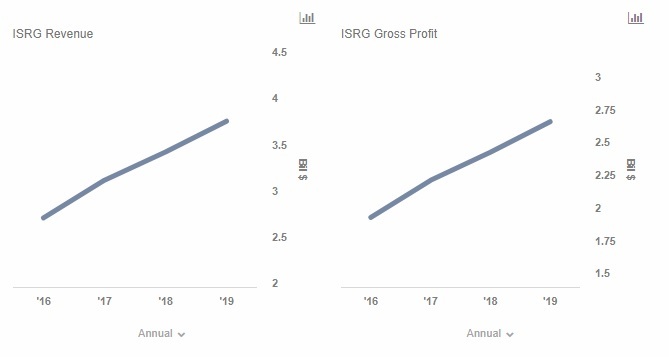 To give investors a quick overview of Intuitive Surgical’s (ISRG) business, we have created an interactive dashboard using Trefis’ technology that shows how Intuitive Surgical has performed in recent years, and how is it likely to grow in the next 2 years. Intuitive Surgical’s Products segment, which includes da Vinci Surgical Systems and related accessories and instruments, accounts for nearly 80% of the company’s revenue and gross profit. Within this segment, a majority of revenue comes from sales of instruments and accessories, which is a largely recurring revenue stream. The remaining 20% of the company’s revenue and gross profit can be attributed to services that it provides to its customers. These services include installing the surgical systems, repairing and maintaining them, and training surgeons to use them. Between 2013 and 2017 (full year estimate), Intuitive Surgical’s revenue increased from $2.26 billion to an estimated $3.11 billion, growing at a CAGR of 8.3%. Much of this growth came in the last couple of years (2016 and 2017), which can be attributed to a rebound in the number of units sold, resulting in a jump in the installed base. In addition, the number of procedures performed has grown at a healthy rate indicating that robotic surgery adoption is likely broadening. 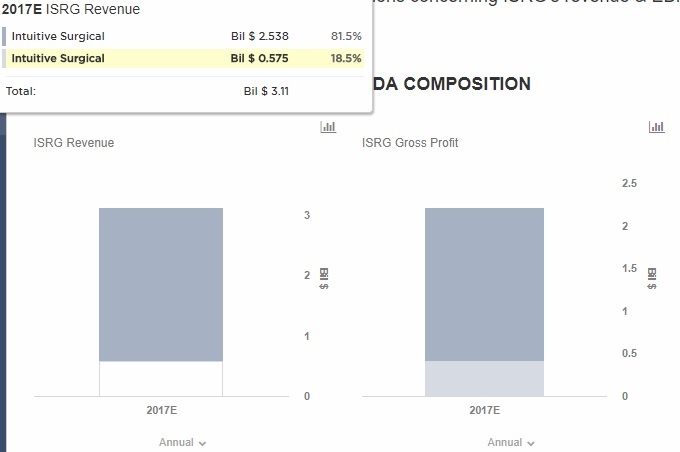 You can see segment-wise details of its revenue and EBITDA growth on our dashboard. We expect Intuitive Surgical’s annual revenue to increase from $3.11 billion in 2017 (estimated) to $3.75 billion in 2019, implying a CAGR of 4.8%. In addition, we expect similar growth in gross profit. The company will continue to benefit from expansion to different surgical procedures as well as increased unit sales. However, we expect some pressure on pricing, and competition is likely to be stronger going forward, which is why we have more moderate growth assumptions for the next few years. 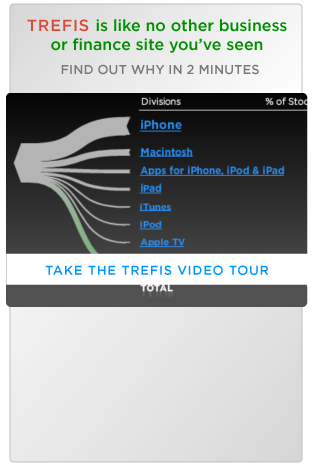 To see segment-wise details of revenue and EBITDA growth, see our dashboard here.